Dare to step outside the box. An intimate peek at one family's homeschooling adventure. 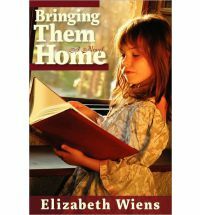 Wiens provides a thoroughly enjoyable read as she takes her readers through one family's journey from public school to home education. I feel passionate about God's desire for Christian parents to train their children and give them a solid biblical foundation. After writing "Bringing Them Home," which deals with the Knights' decision to pull their children out of the public school and follows them through their first year of homeschooling, I knew the story couldn't end there. There are many issues key to the teen years which I wanted to address, as well as a biblical view of courtship. That is why I wanted to continue the story and went on to write "As for Me and My House". I wanted to share some of the challenges we faced through our own homeschool journey, and the blessings we've experienced along the way. Sometimes taking the less traveled road can feel lonely, and it is encouraging to hear from others who have been there before. I hope to encourage parents to teach their teens to be discerning in a world where we are bombarded with so many unbiblical messages. It is easy to compromise and follow the patterns of our culture, but this can lead our children down the wrong path. It is possible to raise our families to a higher standard. If I challenge parents to do this, I will have accomplished much. * Available August 2011. Available to Back Order Now.